In military use, the J75 was used on the Convair F-106 Delta Dart, Lockheed U-2, and Republic F-105 Thunderchief. It was also utilized in the prototype and experimental Avro Canada CF-105 Arrow, Lockheed A-12, Martin P6M SeaMaster, North American YF-107, and Vought XF8U-3 Crusader III. 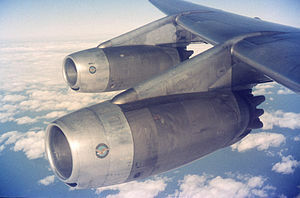 Before the arrival of the Pratt & Whitney JT3D turbofan engine, the JT4A was used to power certain Boeing 707 and Douglas DC-8 models, bringing improved field performance in the medium-range Boeing 707-220 and Douglas DC-8-20, and intercontinental range in the Boeing 707-320 and the Douglas DC-8-30. By late 1959, P&W had considered introducing a turbofan version of the J75, which was to have tentatively been named the TF75 or JT4D. Apparently, little interest was shown by the aircraft industry, so the variant was dropped. After its relatively short lifetime in the aircraft role, the JT4A found more enduring use in the naval role, where the FT4 was produced in a variety of models between 18,000 and 22,000 hp. Well-known uses include the first all-turbine warships, the Canadian Iroquois-class destroyers, as well as the United States Coast Guard's Hamilton-class cutters, the 1970s-built icebreakers USCGC Polar Sea (WAGB-11) and USCGC Polar Star (WAGB-10) (each 3 engines in CODOG configuration), and it was considered for the US Navy's Asheville-class gunboat. The same basic powerplant saw much wider use as a peak demand power turbine running on natural gas. From its introduction in 1960 over 1,000 FT4s have been sold, with many of them still in operation for electrical generation. Outdated by modern standards, refits are available that add catalytic converters to lower their emissions. ^ Wilkinson, Paul H. (1966). Aircraft engines of the World 1966/67 (21st ed.). London: Sir Isaac Pitman & Sons Ltd.
^ "Aero Engines 1960". Flight International: 367–387. 18 March 1960. Retrieved 1 January 2018. Wikimedia Commons has media related to Pratt & Whitney J75.